Truly, he left nothing unprobed, no stone unturned; he befouled the whole world with his treasons, a prodigy of unfaith and prodigal of ill, a limpid spring of wickedness, the attractive tinder of villainy, a lovely place of sin… the originator of the heresy of traitors… a false son to his father… the peaceful king. … In this man, God assembled every kind of goodness and virtue, and the gifts which fortune usually bestows on single individuals of special distinction, she exerted herself to give all together and in richer measure to this man, so as to make him worthy of all commendation. (Otia Imperialia, p. 486-7 in The Instruction of a Prince). Gerald of Wales, Henry II’s protégé and court official, despite bearing grudge towards the father***, about the son writes in the similar vein as Gervase of Tilbury: “ In peace and in private life, he was courteous, affable gentle, and amiable, kindly indulgent to those by whom he chanced to be injured, and far more disposed to forgive than to punish the offenders.” His evaluation of the young man’s virtues is almost identical to the work of his younger contemporary: “ Nothing human, however, can be entirely perfect…” he says, “…and so envious nature, loth that so many good qualities should be united in one person without alloy, added one more signal blemish… “ That blemish, according to Gerald, was the young Henry’s ingratitude and the trouble he caused to his father, the vices he became notorious for. Farther Gerald mentions the young man’s proverbial largesse: “ His disposition was so good that he could never refuse to give anything that was fitting, thinking that no one ought to leave his presence sorrowful, or disappointed of his hopes”. 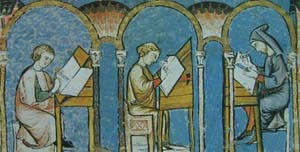 It is Gerald whom we owe more detailed and personal information concerning the Young King: “ In short, he [Henry] considered that he had lost a day when he had not secured the attachment of many by various acts of liberality, and bound them to him, body and soul, by multiplied favors conferred”. Gerald himself ponders over the very phenomenon, noting that “ wonderful as was his career, one thing appears almost miraculous, namely, that almost all the world attached themselves to a man who was totally without resources, either in money or territory”. He agrees that the Young King was too “bent on martial sports”, but, at the same time praises his prowess, calling him another Hector, son of Priam, the only difference being that Hector fought “on behalf of his father and his country” whereas Henry was “led by evil counsels to fight against both”. The latter means that Gerald does not blame his young lord for the rebellion against Henry II and tries to explain the young man’s motives. Those responsible for the outbreak of war should be seek elsewhere. **** He sees Henry’s passing not as divine vengeance, but as “the envious course of fate” which “suddenly, prematurely, and unexpectedly, carried him off in the flower of his youth, and in the spring-time of the year”. Both Bertran and Gerald praise their late lord’s martial skills. Bertran claims him to be the best king ever to bear a shield, whereas Gerald compares his young lord to the “thunderbolt winged by lightening” and gives very vivid description of Henry when in arms and war: “… no sooner was the helmet on his head than he assumed a lofty air, and became impetuous, bold and fiercer than any wild beast”, his “only desire, and the summit of his wishes” being the occasion to prove his valor and fully display his martial genius. To find a more balanced view one should turn to Jordan Fantosme, the spiritual chancellor of the diocese of Winchester and eyewitness to the main events of the Great Revolt of 1173-74. In his Chronicle of the War between the English and the Scots, written without the benefit of hindsight of the Young King’s premature death, he does not condemn the Young Henry for his rebellion, only tries to understand the son’s motives and explain them to the father: “After this coronation and after this investiture you filched from your son something of his honor/ You took away from him his will, he could not get the mastery of it”. Jordan points out that “…A king of land without honor does not know well what to do: the young sovereign did not know it, the gentle and good”. One more balanced opinion can be found in the chronicle of Robert of Torigni, abbot of Mont-Saint Michel, who had met Henry the Young King and his family on a number of occasions and acted as one of the sponsors at the baptism of his sister Eleanor at Domfront in 1161. Upon hearing of young Henry’s death at Martel, he wrote that the sudden passing of “our dearest Lord” was “the occasion to us of deepest grief”. Not because he was Henry II’s son and heir, but because the late prince was “of the most handsome countenance, of the most pleasing manners, and the most free handed in his liberality of all the individuals with whom we have been acquainted”. “One of the most puzzling figure in the history of the time is that of the younger Henry of Anjou, the “young king”, as he is usually called” (in the England under the Angevin Kings, Vol. II, p. 220). Kate Norgate’s is one of the modern voices taking up the subject, but what today’s biographers have to say about Henry the Young King is another chapter of the story. ** Shortly before he contracted bloody flux [dysentery], the Young King, had pillaged the most sacred shrines in western France [St Martial in Limoges, St Amadour in Rocamadour and Grandmont.in Limousin] in order to pay off his mercenaries. *** Henry II denied St David’s to Gerald, the position that was the latter’s lifetime ambition bordering on obsession. The disappointment turned Gerald into the king’s bitter enemy. He gave vent to his malevolence in the texts full of harsh criticism and venom. **** Gerald blames Louis VII of France, young Henry’s father-in-law, and Geoffrey, Duke of Brittany, Henry’s younger brother for talking the “amiable Prince” into the rebellion against his father. According to Gerald, Geoffrey had “the powers of language to throw two kingdoms into confusion” (the Duke himself would have probably taken it as a compliment, not as insult, as intended). Finally he finds one more person to blame, the elder king himself, who constantly held his sons back and did not treat them as father should treat his children, thus pushing them into rebellions, first in 1173, then in 1183. Roger of Wendover’s Flowers of History Vol. II translated into English by J. A. Giles. Internet Archive of Northeastern University Libraries. The Annals of Roger de Hoveden trans. by Henry T. Riley. Internet Archive of Northeastern University Libraries. Chronicle of the War Between the English and the Scots in 1173 and 1174 by Jordan Fantosme translated into English by Francisque Michel Internet Archive of American Libraries. The Poems of the Troubadour Bertran de Born Ed. by William D.Paden, Tilde Sankovitch and Patricia H. Stäblein. University of California Press, 1986. De nugis curialium by Walter Map. Fragments in “On the Instruction of a Prince: the Upbringing of Henry, the Young King” by Matthew Strickland in Henry II: New Interpretations. Ed. Christopher Harper-Bill and Nicholas Vincent. Woodbridge: Boydell Press, 2007. William Marshal. Court Career and Chivalry in the Angevin Empire 1147-1219 by David Crouch. London and New York: Longman, 1990. The World of Eleanor of Aquitaine. Literature and Society in Southern France between the Eleventh and Thirteenth Centuries ed. by Marcus Bull and Catherine Leglu. Woodbridge: Boydell Press, 2005. England under the Angevin Kings, Vol. II by Kate Norgate. Internet Archive of University of Toronto Libraries. I always like to read comments from Geerald of Wales. Scathing comments to start this article though from Walter Map. My goodness, those are harsh words by Walter Map. Poor Henry. :( Great to see the more balanced account of him by Jordan Fantosme (I love that name! :) though. Indeed, Kathryn! Rather harsh:-) but I can't help admiring Walter. There's a true poet lurking behind the lines, and because I too tried my hand at poetry once, his vivid imagination and imagery of his work is so close to my heart. In this I try not to think that it's all about Henry, just focus on the sheer beauty of Walter's poetic language. Reims and Lagny-sur-Marne. November 1179.